Cambodia should have sovereignty over most of the disputed land around the Preah Vihear temple on the border with Thailand, the UN's top court has ruled. Her Cambodian counterpart, Hun Sen, also addressed his nation, repeating a promise to work with Thailand to keep the border peaceful and "not do anything that will lead to tension". "This is a significant step forward... towards a peaceful resolution," he said. The BBC's Jonah Fisher in Bangkok says the ruling was a qualified victory for Cambodia, and the two sides will now have to negotiate. Delivering the judgement, Peter Tomka, president of the International Court of Justice, said the court had decided "that Cambodia had sovereignty over the whole territory of the promontory of Preah Vihear". "In consequence, Thailand was under an obligation to withdraw from that territory the Thai military or police forces or other guards or keepers that were stationed there," he said. On Saturday, the chief of Cambodia's military forces on the Thailand border called an emergency meeting after Thai aircraft were seen flying low around disputed land near the temple. However, Cambodian regional commander General Srey Deuk told the BBC he expected no problems with the Thai military after Monday's verdict. 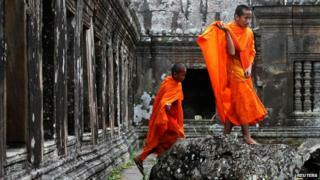 The decision to award the temple to Cambodia in 1962 rankled Thailand, but the issue lay largely moribund due to Cambodia's civil war, which only ended in the 1990s. It came to the forefront again when Cambodia applied for Unesco World Heritage status in 2008, which it won - angering Thai nationalists. Both sides began a build-up of troops in the area.